An “emotional” weekly editor has shared his delight after successfully fighting for detectives to re-open a 20-year-old child murder case. Cambridgeshire Police has announced it will re-investigate the case of six-year-old Rikki Neave, after an 18-month campaign by the Cambs Times and its editor John Elworthy, pictured left. Rikki was found dead in a ditch in Peterborough in November 1994, but his killer has yet to be brought to justice. His mother Ruth was jailed in 1996 for seven years for neglect after admitting “appalling ill-treatment” of her son, but was unanimously cleared of murder by a jury. The Times’s campaign began in January 2014 after Ruth’s husband Gary contacted John, who arranged a press conference to launch a fresh witness appeal and even spent time with the couple on holiday in a bid to “better understand them”. They received a setback when detectives revealed in August last year there was not enough evidence to begin a fresh investigation. A special video report was also produced by the Times in February in a bid to put pressure on the police to reverse this decision. The announcement that the case would be re-opened was made yesterday lunchtime at Cambridgeshire Police headquarters, in Huntingdon. John told HTFP he was “thrilled” with the outcome. He said: “I don’t cry very often but I have over this. It was a very emotional day. “On a personal level this caused me more grief than anything I’ve ever worked on. The Times, which comes out each Friday, held its front page yesterday in order to cover the announcement in its print edition, pictured below. John added his thanks to the newspaper’s parent company Archant for accommodating the late change. He said: “Whatever happens, we as a local paper have done our job and I think we’ve done it extremely well, and up and down the country you’ve got young people and even older people like myself who are extremely passionate about this job. 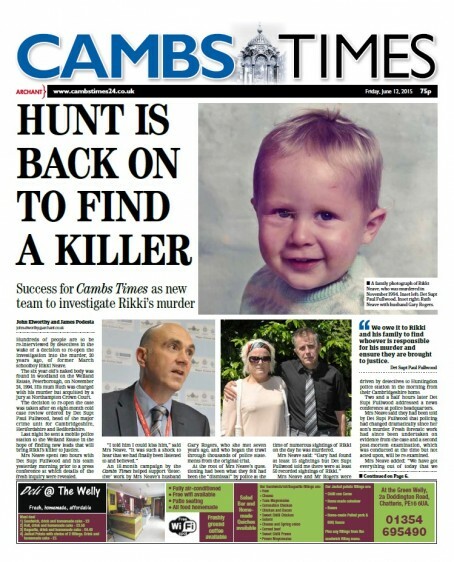 The Cambs Times was not the first for call for a new investigation – the Peterborough Telegraph takes that honour. But it is certainly true to say Mr Elworthy et al have been the most vociferous. 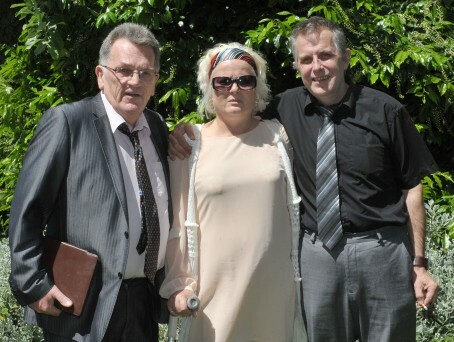 This in a community where many, including her own surviving children, feel Mrs Neave still has questions to answer over how she treated her family and how she protected Rikki. At the very least. That’s not to say that a newspaper shouldn’t support her in her search for justice, but to do so in such a one-sided unquestioning manner is polarising at best and, at worst, has alienated a huge number of locals. Mrs Neave has been proved innocent and it seems likely the killer remains at large. So of course this campaign has merit. But it has glossed over the true feelings of many living on the estate. The two do not need to be mutually exclusive. And going on holiday with them? Surely that smacks of getting too close to the story. Nothing like blowing your own trumpet, (as per usual) – the Telegraph ran similar and at least it was on their patch. There certainly are questions to be answered, but precious little connection with the Times’ area. The child died when he lived in Peterborough. No problem with police re-opening a case, but it is 21 years old and most people in the area have never heard of it – sad, but true. By all means re-open a case, but let’s not pretend it’s all down to one journalist. Who is he doing this for – Rikki? the mother? himself? Archant?